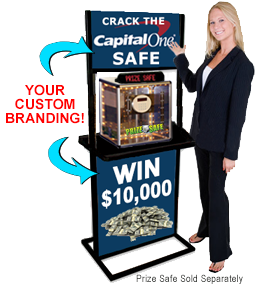 Find out how casinos, banks, radio stations, race tracks, and businesses are using the Prize Safe to create exciting promotions and events! Rent or buy the Prize Safe for your next promotion, whether its for a trade show, corporate event or even just a small scale business or excursion! The Prize Safe adds that extra “flare” to any event! Call us today for more details. 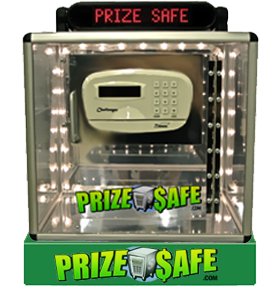 The Prize Safe is a clear, Plexiglas safe that you can fill with incentives for your customers to try to win! With a 4 to 6-digit prize vault code, there are millions of possible combinations! Power Promotions: Looking to create a power-packed event promotion? 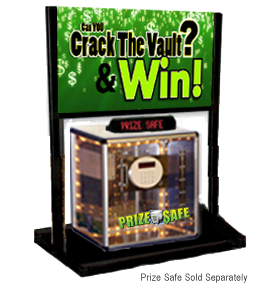 For an action packed half-time race track event, trade show event, or marketing event, print out numerous Prize Safe combinations and seal them in envelopes making sure that all but one of the prize vault combinations is the one that will open the Prize Safe. Have your trade show booth visitors; raffle ticket winners, star employees, or other select participants choose an envelope. Then gather a crowd for the event as each contestant tries their combination on the Prize Safe digital keypad. Everyone knows that someone will crack the Prize Safe – but no one, including the contestants, knows who will be the winner! When the Prize Safe finally swings open, the experience is exhilarating for the contestant and the crowd! 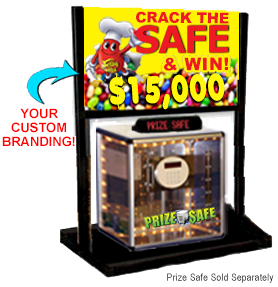 Long-Term Promotions: Keep customers returning to your place of business again and again with the allure of winning the magnificent grand prize inside the Prize Safe. With millions of possible combinations, thousands of participants can try their hand at the combination for months or even years before the prize vault finally cracks! 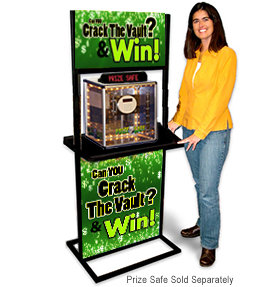 Place the Prize Safe in your retail location, bank, or casino to entice customers to come back again and again and try their hand at the combination for a chance to win! 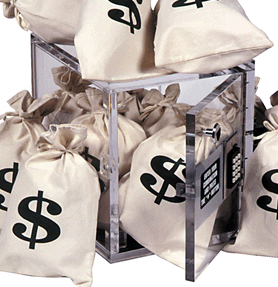 Rent or buy the Prize Safe for your next promotion. Call 800-573-3111 to order or chat with one of our live event marketing specialists now. Promotion Store offers Ideas for Events and free consulting. We work along with your company to promote your business and identify your goals. We help you meet those goals and assist you in designing a promotional contest utilizing one of our biggest Traffic Stopper…. The Prize Safe! From introducing a new product to the public, positioning your company as an industry supplier on a B2B basis, to grand openings for retail stores or directing traffic to your website, or even filling your trade show booth with buyers. 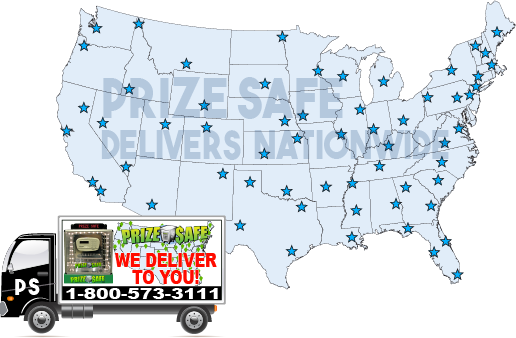 Prize Safe is a powerful promotional tool! Call Promotion Store now at 800-573-3111 to find out more and to order your Prize Safe Business Marketing Promotion Tool.